Additional information regarding the APPA RP3 designation can be found at www.publicpower.org or by contacting Tony Benson at 507-280-1534 or email at tbenson@rpu.org. As the municipal utility of Rochester, Minn., for more than 110 years, RPU provides high-quality and reliable electricity to over 54,000 customers. Water customers number more than 40,000. RPU continually investigates innovative technologies to help customers realize the best value from the services they receive. Current initiatives include photovoltaic offerings, wind energy, energy and water efficient equipment, and electric vehicle charging. Rochester Public Utilities (RPU) and the Olmsted County Environmental Commission are calling for nominations for the 2018 Environmental Achievement Awards. The awards honor individuals, organizations, schools and businesses that have made a significant environmental contribution over the past year in Rochester or Olmsted County. Award categories include: climate change, education, renewables, sustainable food production, conservation, energy, water, and other. Since 1992, the awards have recognized the positive environmental impact of over 100 Olmsted County and Rochester community members and groups. To submit a nomination or to see a list of past recipients, go to www.rpu.org. Completed nominations are due by Friday, October 5, 2018 to Anthony Wittmer (wittmer.anthony@co.olmsted.mn.us). As the municipal utility of Rochester, Minn., for more than 110 years, RPU provides high-quality and reliable electricity to over 50,000 customers. Water customers number more than 39,000. RPU continually investigates innovative technologies to help customers realize the best value from the services they receive. Current initiatives include photovoltaic offerings, wind energy, energy and water efficient equipment, and electric vehicle charging. 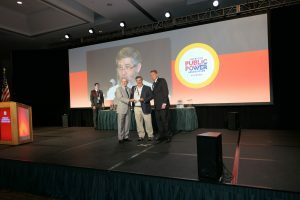 Former Rochester Public Utilities (RPU) Director of Power Resources/Customer Relations Wally Schlink received the James D. Donovan Individual Achievement Award at the American Public Power Association’s (APPA) National Conference in New Orleans, Louisiana. The James D. Donovan Individual Achievement Award recognizes individuals who have made significant contributions to the electric utility and public power. 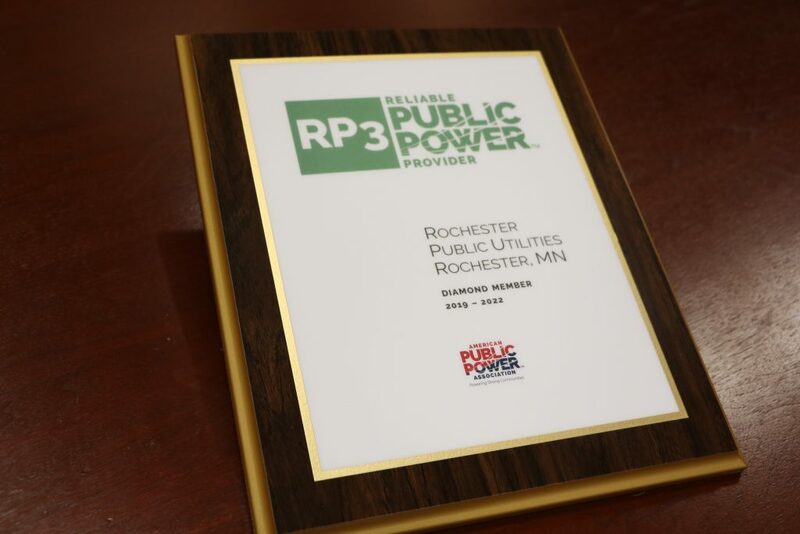 “We congratulate Wally on this much deserved award that recognizes his valuable contributions to RPU, the citizens of Rochester, and the broader public power community,” said Mark Kotschevar, General Manager for Rochester Public Utilities. Schlink was active with the Southern Minnesota Municipal Power Agency (SMMPA) along with serving on numerous boards including the APPA board of directors, the APPA DEED board and the Engineering and Operations section. He began working at RPU in June 1997 and retired in March 2018 finishing a 20 year career with the largest municipal utility in Minnesota. Rochester Public Utilities (RPU), along with Ulteig Engineers, received a 2018 Engineering Excellence Award for its work on the Douglas Trail Substation. The award was presented at an award ceremony hosted by the American Council of Engineering Companies of Minnesota (ACEC). The Douglas Trail Substation project exemplified the importance of strong working partnerships and community involvement. RPU was approached by Epic Systems Corporation for increased electric system strength and reliability at their future data center in northwest Rochester. The best answer to their needs was to build a large substation with an aggressive construction schedule. In order to meet the needs of Epic, RPU partnered with Ulteig Engineers for the project. This is the second RPU/Ulteig project receiving an Engineering Excellence Award from ACEC, with the first award received in 2016 for another substation project. ”RPU has a long and successful history with Ulteig Engineers spanning more than 35 years. We feel Ulteig continually meets and exceeds our expectations and this project was no different. They created plans that were sensitive to the neighboring Minnesota DNR Douglas State Trail to avoid disturbances, fitting a substation on a small triangle of land, all while managing our customer’s design objectives and following a tight timeline. We are very pleased with the outcome of this project and look forward to our continued relationship with Ulteig,” said Neil Stiller, RPU Senior Electrical Engineer. The Douglas Trail Substation Project was completed on schedule. For more information on Rochester Public Utilities visit www.rpu.org. Rochester Public Utilities (RPU) and the Olmsted County Environmental Commission announce the recipients of the 2017 Environmental Achievement Awards. The recipients will be recognized at an awards banquet on January 18 at the Rochester Golf and Country Club. The awards honor individuals, organizations, schools and businesses that have made a significant contribution in 2017 towards environmental quality in any of the following categories: renewable efforts, conservation, energy, water, agriculture, education, and other. Clifford Hansen is an environmentalist who wears many hats. He has served on the Zumbro Valley Audubon Society Board of Directors since 1996 and has been the secretary since 2000. He has led the annual Christmas Bird Count, gathering data to better understand the relationship between global warming and migratory patterns, since 2001. In 2010, Clifford began volunteering at Quarry Hill Park. He has helped restore sections of the park to its native flora by removing invasive species and has inspired others to do the same. When he’s not clearing buckthorn and garlic mustard, he shares his knowledge with community members who visit the Quarry Hill Nature Center. Additionally, Clifford is a citizen forester group leader with RNeighborWoods, an organization that promotes the communal benefits of trees. Clifford has helped plant hundreds of trees throughout Rochester neighborhoods. Students helped build the garden boxes, filled them with a mixture of soil and compost, planted vegetable seedlings, learned how to cook using local ingredients, and much more. Produce harvested in the summer was brought to the school’s Community Resource Room to support families in need. By integrating an environmental ethic into their operations, Hy-Vee is demonstrating what’s good for the environment can also be good for business. Company-wide, Hy-Vee sells responsibly sourced seafood, participates in the “Misfits” program—an initiative to combat food waste by selling discounted produce that doesn’t meet traditional cosmetic standards—and recycles millions of pounds of cardboard, plastic, and paper every year. In addition to these policies, each of the four Rochester stores has partnered with Community Food Response (CFR) and the Channel One Regional Food Bank to divert food waste. Last year, the stores collectively donated over 164 tons of food (22 tons to CFR and 142 tons to Channel One). John and Patty Trnka have dedicated countless hours to controlling invasive species within Olmsted County Parks. Each week from March through December, the Trnkas make rounds through Chester Woods and Root River Parks. They identify areas infested with invasive species, develop an eradication plan, and train other volunteers in the eradication process. In the fall, John and Patty lead volunteers in collecting seeds from native grasses. These seeds are stored and later planted in areas that have been cleared of invasive species. The Trnkas also assist with record keeping at Root River Park. Inspiring teenagers to pick up garbage on a Saturday afternoon isn’t easy. But that’s exactly what Max Campeau did last April when he organized a clean-up event along the banks of the Zumbro River near Pine Island High School. Approximately 25 students picked up litter along a two-mile stretch of river, starting at the high school and ending at the outdoor classroom, where volunteers planted new habitat in the butterfly garden. The group also planted 50 tree seedlings that had been donated by the Minnesota Department of Natural Resources. The litter collected at the event filled over 30 garbage bags. Becca Jacobson and Annette Homburger started Stewards of Hope as a partnership between the Manor View Drive Neighborhood and the People of Hope Church. Together, they coordinated efforts to establish a nature trail within a 20-acre wooded area near the church. From May to August, Becca, Annette and over 100 volunteers representing numerous non-profit organizations, cleared brush, removed invasive plants, and seeded native grasses. Money from the Izaak Walton League of America was used to build trail signs and an informational kiosk at the trailhead. Funds from the Minnesota Master Naturalists were used for supplies to help remove buckthorn.